Visiting the Hamptons! Rogers Beach in Westhampton, on Long Island in New York. The summer night breeze caresses customers' sun-burned skin, relieving the day's intense heat. The sweet, unmistakable aroma of freshly baked chocolate chip cookies, pies, and French vanilla coffee surround them. There are no hostels in the Hamptons, but that doesn't mean there are no cheap hotels. Lucky to find a seat on a bench outside Simon’s Beach Bakery, a variety of people come together to listen to the sound of a young, local band covering their favorite rock songs. A hundred people congregate on the sidewalk, singing, and dancing. Two women in high heeled pumps, bright print, skin-tight Capri pants, expensive designer tank tops and large, 'movie star-esque', sunglasses “Twist and Shout” side by side with a couple in torn Levi shorts, and cotton ‘Westhampton Beach’ T-shirts made just down the street in the T-shirt shop. The couple each holds one of their tiny daughter’s hands and they swing her in the air to the beat of the music. She giggles uncontrollably. Seven or eight young children run in and out of the crowd in bathing suit bottoms, flip flops and sweatshirts. The Bayview Resort in Hampton Bays, NY has inexpensive hotel rooms and great views. Now, this doesn’t sound like the scene in an exclusive, ‘VIP only’ location, does it? Simon’s Beach Bakery, in Westhampton, NY is truly a small taste of the Hamptons as a whole; fun, classy, upbeat, but not too uptight. While many nightclubs, bars, and restaurants seem to have an exclusively rich and famous crowd, many places in the Hamptons, like Simon’s Bakery, offer a more laid back atmosphere. Another common misconception is that you have to spend your life savings to visit the Hamptons for a few days. While many Bed and Breakfasts and hotels are priced in the high hundreds or even thousands per night, the Hamptons offer many inexpensive options for a relaxing, fun-filled vacation. The key to a cheap visit is going during the week. Restaurants, hotels, and events often hold weekday rates and specials, saving you a bundle of money while you still get to enjoy the Hamptons. I set out to plan an activity-filled few days in the Hamptons on a budget. I found three very nice hotels were all reasonable. The Bayview Resort is around $230 per night. Both are located about a half of a mile from the water, five minutes from downtown Southampton and under 10 miles from Westhampton. Here is TripAdvisor's list of ten of the least expensive hotels in the Hamptons. The East End Budget Host Inn is located in Riverhead, NY- only a few miles away from West and Southampton, and its prices are around $110 per night! It is also minutes from the Tanger outlet mall, and the Splish Splash Water Park, where admission is $22 to $30 per day, depending on age. The trick, however, is to go to the park at 4 p.m. You still have three hours until closing and admission is discounted to $18 to $23 and lines are much shorter for rides and stands. 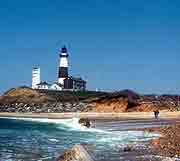 Visiting the lighthouses on the Hamptons is a tradition. There are many restaurants that offer entrées for under $10 without losing the Hamptons dining feel. In Southampton, The Driver's Seat provides excellent meals, a casual atmosphere and an outdoor deck for al fresco dining. Enjoy the lobster rolls and organic roasted chicken. 66 Jobs Lane, 283-6606. For something a little more elegant, but not over the top, try the Red Bar Brasserie 210 Hampton Rd, (631) 283-0704. The Southampton Beadery is the perfect place for the jewelry buff to create a Hampton's souvenir. La Parmigiana of Southampton serves fine Italian cuisine priced between eight and 21 dollars. Belle’s Café is a moderately priced Cajun restaurant in Westhampton, and Sip N’ Soda is a Southampton retro luncheonette with meals under eight dollars. There are also relatively inexpensive delis, bagel shops, and pizzerias all over the Hamptons. My personal favorite Hamptons dinner, however, is in Westhampton Beach at the very end of Dunes Road at the Beach Hut snack bar. On Wednesdays and Sundays, a live band plays on the beach, while you enjoy your lobster dinner special (a 1 ¼ pound lobster and corn on the cob for only $10.99) and kick back with twofer Margaritas. Pick up a local Dan’s Paper while on the island for other ‘on the beach’ specials. 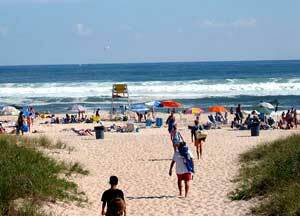 While many beaches require permits and have expensive parking on the weekends, they are typically not too crowded and less expensive on weekdays. 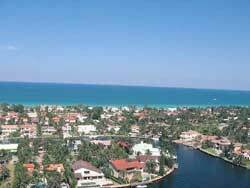 However, parking can still be costly and it may pay to walk, take a taxi, or carpool to the beach. Cooper Neck and Old Town Beaches are the most popular public beaches in the area, both located in Southampton, as well as Roger’s Beach and Pavilion in Westhampton. Trips to the Tanger Outlets in Riverhead are popular with people visiting the Hamptons on a budget. Other inexpensive attractions include a trip to Tanger Outlets in Riverhead. The outlets contain factory-priced merchandise with stores like Coach, Nike, DKNY, Pottery Barn, and more than 160 other brand name factory stores. Wine tasting is a delightful way to spend a day of your vacation. The Hamptons have some of the finest vineyards and wineries around. Four vineyards, in particular, have inexpensive tours and wine tasting. Jamesport, Martha Clara, Palmer, and Paumanok have tastings from three to four dollars and tours from zero to four dollars. 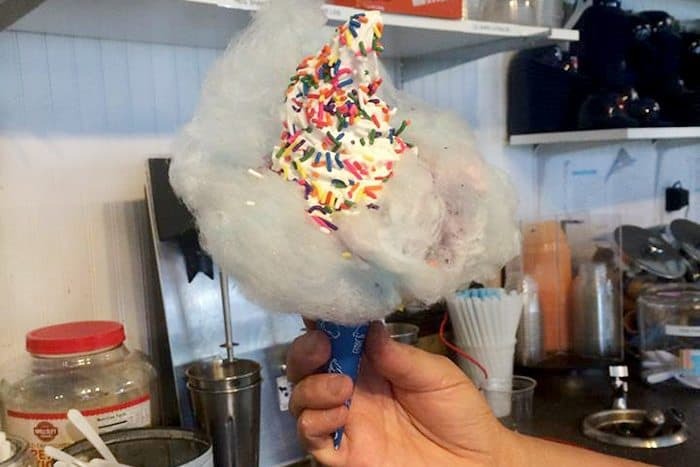 A cotton candy ice cream treat at Shock Ice Cream, in the Hamptons. While the stores and boutiques in the Hamptons may seem a bit pricey, keep an eye out for a great deal or big sale. Max and Gino’s, a clothing store in Westhampton, often has a sale rack outside with designer brand clothing for very cheap. The Shoe-Inn also has some great summer sales. Window shopping is always fun as well. At night, after stopping by Simon’s Bakery for a cup of coffee and a quick dance, visit Shock Ice Cream and Candy Store in Westhampton. It’s located behind Shock Baby clothing store and is a must-see when visiting the Hamptons. Shock has every candy, homemade candied popcorn, and every ice cream flavor imaginable from apple pie to cotton candy to chocolate covered banana. The Hamptons often have inexpensive concerts and shows at the Performing Arts Center, deals on museum tickets, beach parties with under $10 admission fees, and free horse shows at the local stables. And don’t forget the camera! Aside from great beach views and sunsets that you may want to capture, the Hamptons are famous for frequent celebrity citings. Keep a lookout for some great Hamptons events and attractions at Hamptons.com, or the Hamptons local paper, Dan’s Paper. Jessica Taryn Zolotorofe is a former intern at GoNOMAD. She is now a lawyer in New Jersey. It really helped when you said that going during the weekdays can be more affordable since the rates will be lower due to their promo. I will definitely suggest this to my husband since we plan to celebrate our fifth anniversary in a hotel. With this tip, I guess we would have to file for vacation leaves to save.